The seated figure of Liberty was derived from the image of Britannia on contemporary English coins. It was also well in keeping with the Greek Revival in the arts that began in Europe in the 1820s and reached America just a few years later. Thomas Sully provided the original illustration for the Seated Liberty, and this was translated to a relief model by the U. S. Mint's Christian Gobrecht. Debuting on the silver dollar in 1836, this design was adapted to the quarter dollar beginning in 1838. 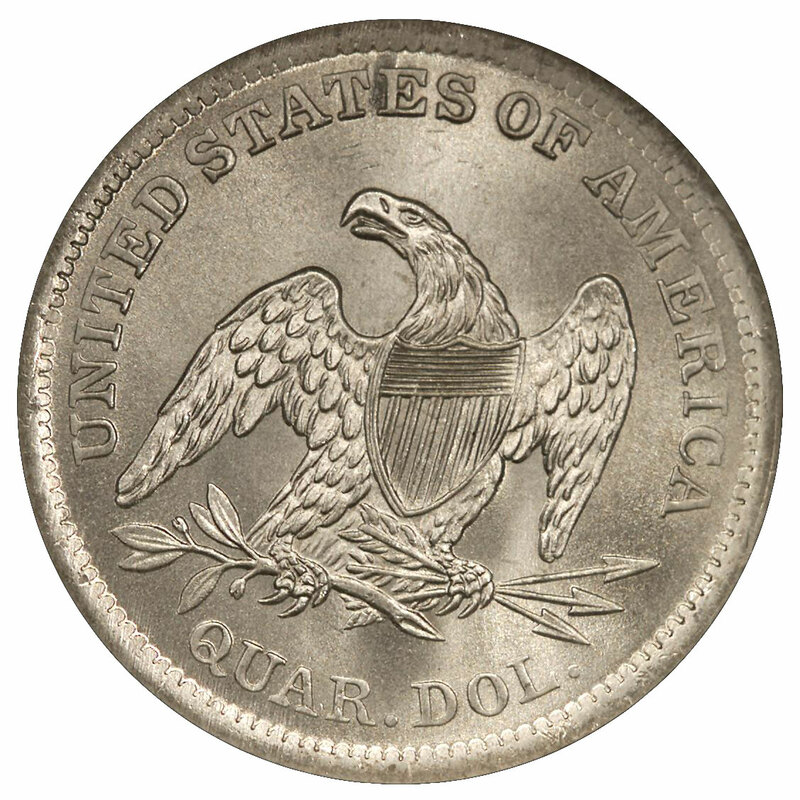 Unfortunately, the dollar's soaring eagle reverse was set aside in favor of the conventional shield-breasted eagle in use since 1807. There are several subtypes within the Seated Liberty quarter dollar series, which ultimately continued through 1891. The obverse was entirely remodeled by Robert Ball Hughes in 1840, and that year is transitional. There are a number of small changes evident in the design, but the most obvious is the placement of an additional fold of drapery at Liberty's left elbow to reduce the illusion that she is hunched over. The motto IN GOD WE TRUST was added to the reverse beginning in 1866, and that addition was accompanied by subtle changes in relief that affected the grading of these later pieces. In fact, close examination of this long series reveals a number of minor changes that are reflected in the coins' wearing quality. For instance, the lowering of the relief of both sides of this type in 1859 and again in 1866 was accompanied by a reduction in the broadness and depth of the rims. This likely increased the useful life of the dies, but it also led to more rapid wear, which is particularly noticeable on the reverse. It's not unusual to find unequal grades between obverse and reverse on these later coins, the reverse typically being first to wear into the lettering. Ironically, more obvious changes, such as the addition of arrows and rays in 1853, had no noticeable effect on wearing quality. Seated Liberty quarters are generally well struck, though some of the "No Drapery" coins of 1838-40 will be weak at the eagle's right leg. This should not be confused with wear. Uncirculated examples of all but a few dates in this series are scarce. Among "No Motto" coins the dates most often found in mint state are 1858 and 1861, these Philadelphia Mint coins being available in sufficient numbers to supply the serious type collector. 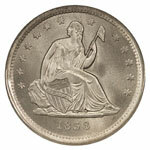 For coins having the motto, the likely type set candidates include 1876, 1877 and 1891. It should be noted, however, that the subtype with the motto has a lower overall relief on both sides, as well as reduced sharpness in the details. These coins often appear lightly worn even when uncirculated. Though quite common in worn condition, the "Arrows and Rays" quarters of 1853 and the coins having just arrows (1854-55, 1873-74), are surprisingly scarce in mint state. Combined with the great demand for these pieces from type collectors the result is very high prices for the better examples. A small, mint state hoard of the 1874-S quarter (about 80-100 pieces, according to Walter Breen) surfaced about 1950, and this issue is still more available than others of this subtype, though the hoard has been fully dispersed. The Seated Liberty quarter series includes so many rarities that few attempt to complete a set by date and mint, even in the circulated grades. For the type collector there are no major obstacles to locating mint state examples of each desired subtype, though, as noted above, the coins having arrows at the date will be a bit pricey. Whether one is seeking mint state or circulated pieces, certain guidelines should be observed. The most desirable coins are ones having original surfaces, meaning that they've never been harshly cleaned. A fully white coin has likely been dipped at one time, but this won't hurt it if the work was done carefully and did not impair its luster. Toned coins can be attractive too, but the toning must be natural. This requires an experienced eye to distinguish.